Saturday was a family beach day at Makapuu, but seeing as the flying conditions were looking great, I threw in the XC wing just in case. When we arrived, Frank was buzzing around the bowl and Jim was tanning his wing on the carpet at Juice. 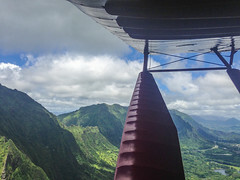 Alex called having just gotten off of Hawaiian Air's Bellanca, scouting the conditions along the Koolau range and remarkably not seeing a single paraglider. I looked up from the beach about an hour later to see a group of pilots forming on Crazys. I left the gang at the 'scenic' beach, let them know I would be back in an hour or two, or I might call from somewhere else. Alex, AK Chris, Tom RD and I all launched. As I was climbing out and phoning how I might be late or need a ride, Alex was on the radio talking about a big squall line coming in and how he was going to wait it out. On radar the squall was from Makapuu to Waiahole. What I saw was some squalls far offshore on a light wind day, which to me meant a very long wait. I had about two hours to play, and with a 3,000+ foot cloudbase down range, and light winds, a great window to fly. Forty minutes later I was at Temple Valley, up high with hardly a turn needed. I looked back at Makapuu to see the rain hitting there. As is normal on a north day, the flying slowed considerably from here on. The rain scared Kim and the gang off the beach and they were headed my way for retrieve. I got low on the pyramid ridge and spent a while there. The rain was hitting Kaneohe behind me and squalls were lining up at Kaaawa. I decided to go land at Waiahole, and of course I suddenly scored a great thermal up to cloud base. I barely touched down at the park and my van drives up for retrieve. 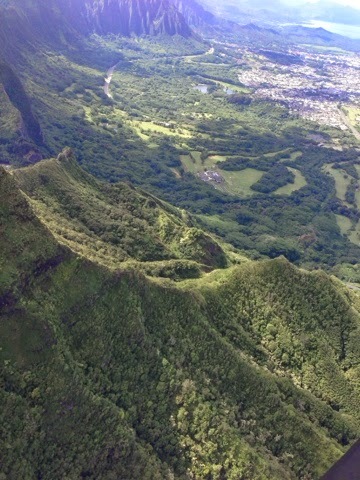 After landing I looked to the back of Waikane valley and it all turned to rain. Perfect timing. Dam it Dave! Not only are you one of our crazy good fliers but can spin a story. Love the title, that song was buzzing in my head while reading this log. Made my 'coffee flavored kisses' a little less bitter, Gotta love the Monkees. Alex was kicking himself when I arrived. We boated around and checked on your progress as the squirrels got closer. Alex kept saying, "I should have gone with Dave." Well Dave, you and I have a thing for trains and as long as your driving I would have to follow. Just,"Don't Leave me at the station, cause I'll be there in the morning." Glad Kim was able to fetch you! She has to be one of the best looking retrievers ever! Thanks for the story, really made my day, lets go get some more material. It's Time to Fly Get Your Gear, follow Dave and Go!!! Great story Dave. Funny how your flight and story vindicate both of our decisions. I'm relieved I didn't fly anywhere near that shearline! But I'm happy you showed us what's possible when you're flying fast! Too fast to take more than one small blurry picture apparently! I've never made it Temple Valley in less than an hour and a half! 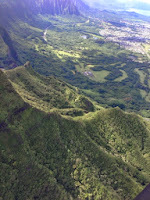 I never take any photos, that is a photo of Koolau Golf Club where we are getting married in two weeks. I usually don't talk on the phone on an XC flight,but Kim needed instructions and directions, I could have easily have been snapping away. If you were in the frame i would have taken more photos, next time. Thanks for the photo drop, great photos of a familiar spot from a different perspective.